Band Substance: The Bootleg Beatles take us back to 1967, even though Steve White, left, can’t remember it. Granted, it’s not necessarily the best way to start a conversation, telling an interviewee who plays in a tribute band that I’ve always felt there are so many great groups out there that it’s pointless featuring such acts. But while Steve White’s possibly wondering how to respond to that, I tell him that if I’m going to break my own rule and speak to one tribute act, then it should be The Bootleg Beatles. Yes, The Bootleg Beatles are back out on the long and winding road, heading to a town near you, seeing off 2017 in style, after another remarkable year for one of the most successful tribute bands on the circuit. 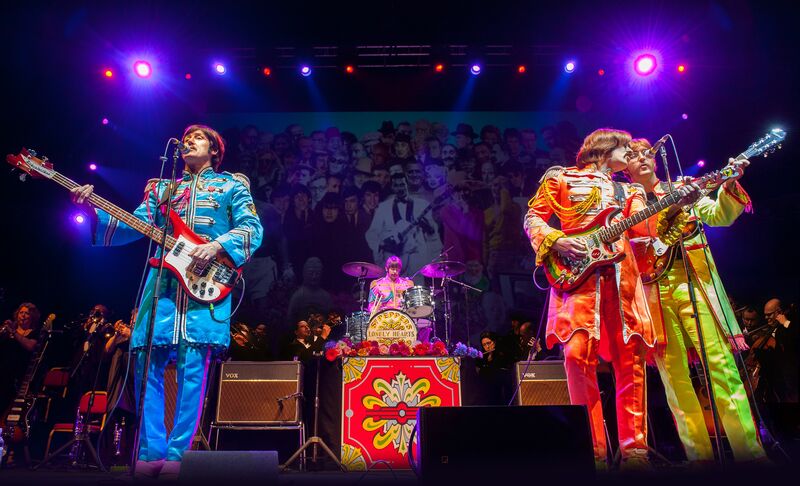 The Fab Four copyists (I can’t call them The Prefab Four, because that’s clearly The Rutles), complete with their string and brass ensemble, are visiting 15 cities, and after 37 years perfecting their art, it’s fair to say they know what they’re getting into. Since their inception in 1980 they’ve performed thousands of shows around the world, with recognition and respect from many involved in the inner circle of the original group. By way of example, Sir George Martin described The Bootleg Beatles’ experience as ‘A terrific show’, and George Harrison even shared a few stage secrets with the band. And as far as Steve – who takes on Paul McCartney’s role – is concerned, it’s been Getting Better and better this year, a run of memorable concerts marking the 50th anniversary of the Sgt. Pepper’s Lonely Hearts Club Band LP including a rather special date at the Royal Albert Hall with the Royal Liverpool Philharmonic Orchestra and two performances at Glastonbury Festival, including a Pyramid stage set. But they’re not quite done yet, their current run featuring an extended Sgt. Pepper section to further celebrate that iconic 1967 album. 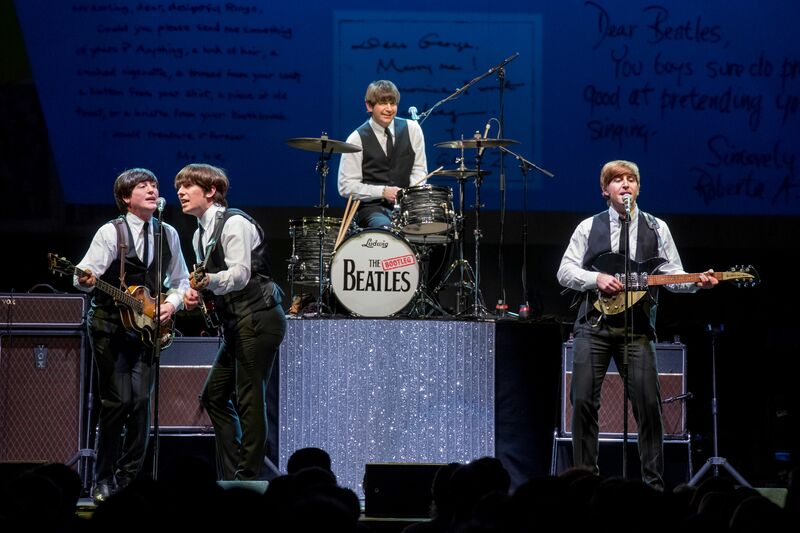 Formed from the original cast of London’s West End show Beatlemania, The Bootleg Beatles have become something of an institution in their own write, as John Lennon may have put it, through their note-perfect recreation of hits from every era of the original band’s treasured song catalogue. The detail is somewhat meticulous, from costumes to authentic period instruments, and from the Liverpudlian banter to the inflective vocal mimicry. 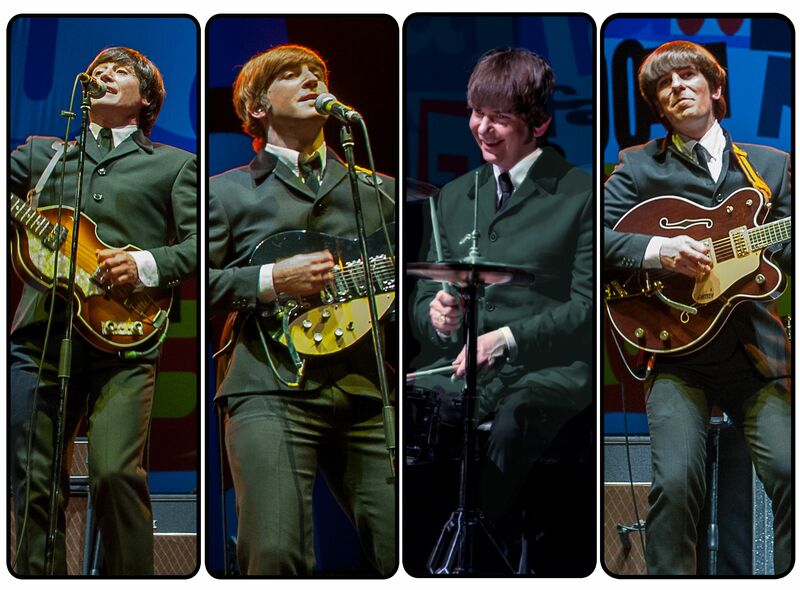 What’s more, there’s an uncanny resemblance to the Fab Four, not least Steve, out there as Paul for the past five years. He was back home in Nottinghamshire when I called, after a month touring Australia, Malaysia and Hong Kong. 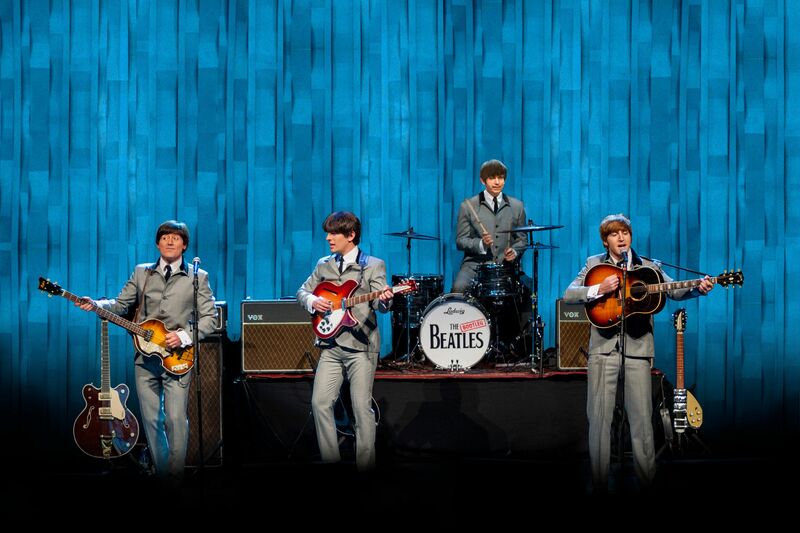 But as he put it, ‘A few days home, then we hit the floor running!’ And while the 48-year-old’s only been part of the story for the last half-decade, and never got to see the original Beatlemania show, he’s certainly made up for lost time. Steve, who sings, plays bass and keyboard for the band, is the third ‘Bootleg Paul’ in 37 years, with the first, David Catlin-Birch, there for the first seven years, then a later 11-year stint, while fellow originals Andre Barreau (Bootleg George) and Neil Harrison (Bootleg John) went on to put in more than 30 years’ service each, and are still involved behind the scenes. But these days, the stage dynamics are shared by Steve, Adam Hastings (‘Bootleg John’ – guitar, vocals, keyboard, harmonica since 2011), Stephen Hill (Bootleg George – guitar and vocals since 2014) and most recent addition Gordon Elsmore (Bootleg Ringo – drums, percussion, vocals, since last year). I see there was a bit of a crossover, with Steve getting to work with both David and Andre in the early stages. Did they talk a lot about the band’s early days? Incidentally, Elgood soon made way for Rick Rock, aka Ricky Goldstein, formerly with Sham 69, who also put in more than 20 years’ Bootlegs service. And while I’m playing a Michael Caine-like ‘not a lot of people know that’ game, word has it that the Bootlegs looked to copy their own 1999 performance on Apple Corps’ rooftop at No.3, Savile Row, Mayfair, 10 years later (a tribute to a tribute act, maybe? ), but health and safety concerns prevented them. They say if you can remember the ’60s, you weren’t really there, and seeing as Steve was born between the release of the Ballad of John and Yoko and Something singles, at the ‘back of the ‘60s’, he definitely falls into that category. Standing There: The Bootleg Beatles get down to it, with Steve and Stephen harmonising on the left. While my own birth date was five months after the release of Sgt. Pepper, Steve’s was three months before Abbey Road, which for me is up there with Revolver as the best of so many great albums (of course, I might change my mind in a few minutes and cite a couple of different ones, not least Rubber Soul, Help, and The Beatles). So what was this Beatles fan’s route into all this? But his abiding love of The Beatles and his dedication to the cause went even further, as it turned out, with Steve taking his music obsession to a new level. “I was a right-handed rhythm guitar player in a John Lennon type role, but we’d turn up at venues and people would say, ‘You’ve got to be Paul, yeah?’ I wouldn’t say I look too much like him, but there’s a nod to that. So me and the bass player decided to swap over, leading to months of restructuring, learning harmonies and basslines. But then the audiences would ask if I was left-handed. So I thought I’d best have a go at that, teaching myself left-handed. For a while it was difficult, but over time it’s got easier. Well, the original band barely lasted a decade, so David hadn’t done so badly, service-wise. Mop Tops: Twisting and shouting, Bootleg Beatles style – From the left – Steve White (Paul), Stephen Hill (George), Gordon Elsmore (Ringo), and Adam Hastings (John). At that point we get on to left-handed guitarists, and how I’d always used the fact I was left-handed for not being a great bass player and guitarist, despite the likes of McCartney and Jimi Hendrix spectacularly showing me up. And seeing as Steve’s been to all that trouble to learn ‘the wrong way round’, I told him I’d class him as an honorary left-hander. I can’t quite believe at this point that I’m talking about comfy slippers in a complimentary way with a rock’n’roller, but there you go. Perhaps there’s something in that old baloney about the comparative social qualities of The Beatles and The Rolling Stones, not least which you were more likely to be able to get away with taking home to meet your parents. On a similar front, I tell Steve that my older sister and her husband are big fans of the competition, a tribute band going by the name of The Counterfeit Stones. Does he know them fellas? So is there a good bit of rivalry there? Oddly enough, my first experience of seeing a recognised tribute band live came via Australian ABBA act, Bjorn Again in Blackburn in 1998, and I was suitably impressed by their between-song banter, playing out intricate insecurities between members and the increasingly broken relationships within the unit. Do The Bootleg Beatles tend to go in for such stage drama? I have to ask, are you a fan of The Rutles? Poster Boys: How it all began. 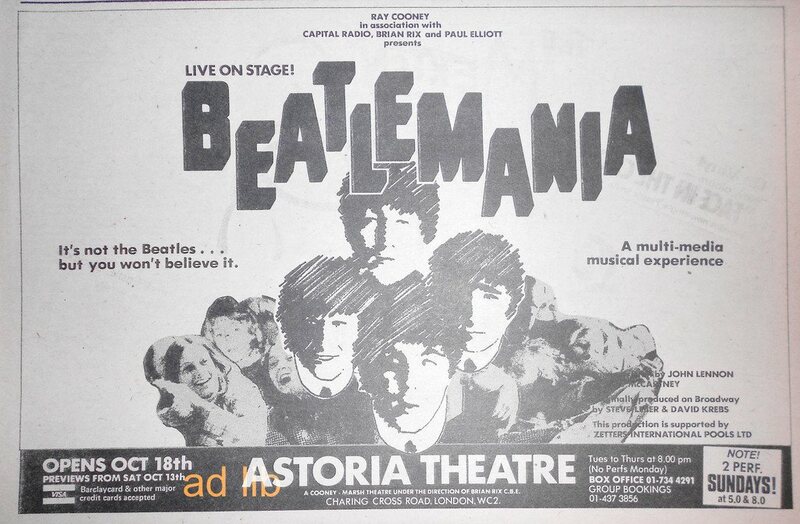 The original show that ran at the Astoria Theatre from late 1979 to early 1980. Is there a bit of Dirk McQuickly (Eric Idle’s McCartney-like character) in your act? Now , there’s a thought. Do you think I should go out there and form The Replica Rutles? My half-baked ‘leftie’ playing might be seen as an advantage, after all. I’ve seen nice words from both George Harrison and Sir George Martin about the show. And there’s a quote on your website from Paul, saying, ‘I’m gonna come to your next gig and heckle ya!’ Have you spoken to the man himself, or got any feedback on your portrayal? Talking of anniversaries, we lost John 37 years ago (this week), the year The Bootleg Beatles started. He would have been 77 now, and I often wonder where he’d be at now, if he hadn’t been taken away so young, and how much more great music he might have shared with us. Such a shame. But Paul is still going strong, and he’s made them some great records in recent years. Is that right that the first Bootleg Beatles gig was at a student gathering in Tiverton, Devon, in late March, 1980? Well, more than 4,000 gigs later, I think you’ve had the last laugh on the doubters. It must have been really something, playing the Royal Albert Hall with the Royal Liverpool Philharmonic Orchestra, and playing Glastonbury Festival’s Pyramid stage this year. “It’s been absolutely fantastic. To work with an orchestra of that scale is absolutely fabulous anyway, and then with the added bonus of performing start to finish the entire Sgt. 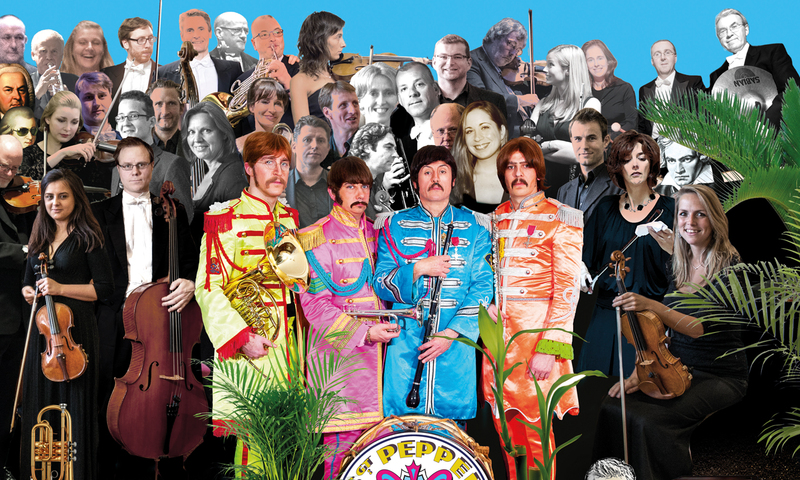 Pepper album with that 70-piece orchestra – incredible! December UK dates: Tue 5 – Cardiff St David’s Hall (02920 878 444), Wed 6 – Bradford Alhambra (01274 43200), Fri 8 – Harrogate Theatre (01423 502 116), Sat 9 – Leicester De Montfort Hall (0116 233 3111), Sun 10 – Liverpool Philharmonic Hall (0151 709 3789), Mon 11 – Edinburgh Usher Hall (0131 228 1155), Tue 12 – Glasgow Royal Concert Hall (0141 353 8000), Thu 14 – Sheffield City Hall (01142 789 789), Fri 15 – Birmingham Symphony Hall (0121 345 0600), Sat 16 – Newcastle City Hall (08448 11 21 21), Sun 17 – Nottingham Royal Concert Hall (0115 989 5555), Tue 19 – Bristol Colston Hall (0844 877 1500), Wed 20 – Manchester Apollo (0161 907 9000), Thu 21 – Plymouth Pavilions (0845 146 1460), Fri 22 – Brighton Centre (0844 847 1515). Tickets, subject to a booking fee, can be booked at www.ticketmaster.co.uk. 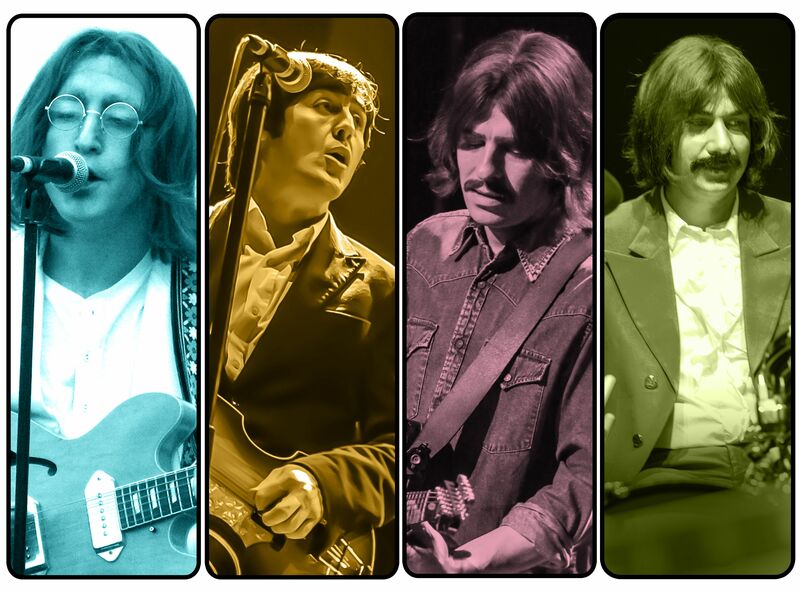 For more information about the band, head to www.bootlegbeatles.com. This entry was posted in Books Films, TV & Radio, Comedy & Theatre, Music and tagged Beatlemania, Bjorn Again, George Harrison, George Martin, John Lennon, Paul McCartney, Ringo Starr, Royal Albert Hall, Royal Liverpool Philharmonic Orchestra, Sgt. Pepper, The Beatles, The Bootleg Beatles, The Rutles, tribute bands. Bookmark the permalink.